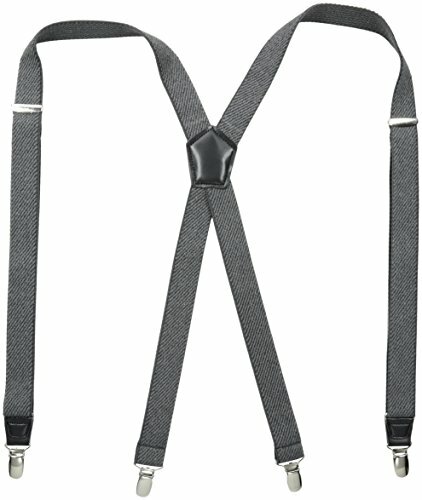 Dockers Men's Textured Solid Suspender,Gray,One Size | What Should I Say? PERFECT STYLE - Sleek in its clean design, this men's brace speaks just loud enough to accommodate a variety of silhouettes stylishly. The solid color and silver clinch makes it a well-dressed man's must have. Enjoy a good fit with our high quality clasps that grip on securely without unintentional unbuckling. UNIQUE DESIGN - Solid, timeless and classic design is perfect for work, prom, wedding or enhanced a casual look. Metallic hardware add a sophisticated touch to this timeless suspenders and to your outfit. FULLY ADJUSTABLE - Each side is adjustable by loosening the metal clamp and sliding it up or down to the length that you prefer.These pants suspenders are 1 1/2"wide. Classic solid suspenders featuring embossed leather patch. One size fits up to 42. HOW TO USE - Just quickly and easily release the two front clips when needed. Ideal for work, occasions, or to dress up a casual look. Work best with: dress pants, trousers, or jeans.